This is a day to celebrate with our current St. Peter’s School students and families. If your children are enrolled this year, please join us! 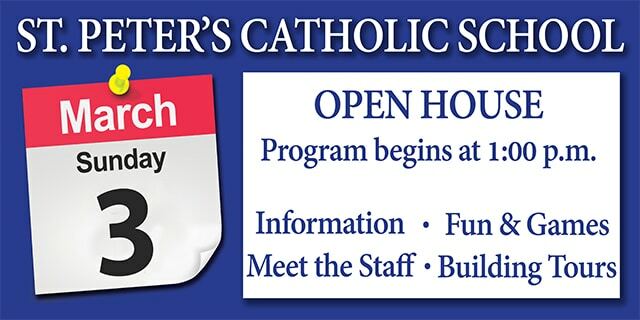 This is also a day for prospective St. Peter’s School students and their families. Meet administrators, teachers, coaches, and current families, tour the building, receive information on curriculum, extracurriculars, tuition assistance and State of Ohio School Choice scholarships. Fun, games, and prizes for students and parents! The mission of St. Peter’s School is to graduate students who practice Christian spirituality, achieve academic excellence and are prepared to be of service to the world. St. Peter’s stresses family spirit among its students, faculty, parents, and alumni, who by their example, instruction, and concern mutually support and assist one another. St. Peter’s admits students of any race, color, national or ethnic origin to all rights, privileges, programs and activities generally accorded or made available to students at the school. It does not discriminate on the basis of race, color, national and ethnic origin in administration of its educational policies, admissions policies, scholarship and loan programs, and athletic and other school-administered programs.